Home / Super Screener Results / Super Screener Crushes Kentucky Derby 2014! Super Screener Crushes Kentucky Derby 2014! The Kentucky Derby Super Screener crushed the 2014 Kentucky Derby by cashing a $2 Exacta that paid $340, $7 in Trifectas worth $11,284 in total, and a $1 Superfecta worth $7,691. In total, the Super Screener tickets cashed for $19,315! At the bottom is a full chart of the recommended tickets. And this amazing score from NY! 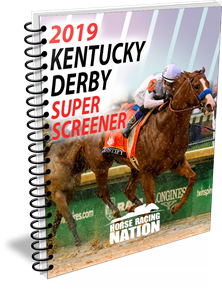 Get Your Copy of the 2017 Kentucky Derby Super Screener NOW! ← Previous Story How Did The Super Screener Do On Breeders’ Cup 2013? Played the medium bracket. Won 5 times my investment ! Look forward to the Preakness ! You guys are AWSOME!….I Hit the Tri and the Super for over 9 thousand dollars…the biggest payout in my 50+ years in horse racing….Thank You so much…Mike Shutty you and your crew are the best by far! Why thanks, William, and congrats on your score! I hit the $1 tri. Had the top 4 horses on the ticket. Thank you so much. Made my derby day very enjoyable. Thanks for the GREAT !! JOB my dad and I bought the super screener for the 2nd time. This year we cashed in on the ex,Tri and super !!! We ware blown away!!! WOW for the first time ever I hit the tri ,I was going to change the oder of horses you gave then I said I have been losing for years let me keep the way super screener told to so I did and I’m so happy today. No handicapping team can touch super screener your the BESt.thanks. I hit 4;000.00 dollars. Thanks superscreener. Thanks for my biggest payday ever!! I bet your aggressive wagers and scored big!! Thanks !!! Been following you for several years – I have occasionally made a couple of SMALL variations from your recommendations & never NOT hit the trifecta – even last year !! Bet the Super & Tri this year & hit both – $1 – TWICE EACH !!! You were recommended by a friend – Denny A. in florida. THANK YOU !!!! Greg O. Sorry, I should have explained the variation. On your last aggressive $1 Super here is how I bet it: 4 5 16 18 20 / 4 5 14 16 17 18 19 20 / 4 5 16 18 / 12 14 17 19 20 = $396. Greg O.
Congrats on the big score! The tickets are recommendations and we encourage people to have confidence in their opinions and build on them if they feel strongly about a horse – you did to great success! Great job! You did very well with your selections but through my own fault i did not cash. i had to participate in a mandatory golf outing which had it on kentucky derby day for the first time. i sent a 1.00 superfecta with a friend to otb. in the middle of the round he called and said the cost was not 100.00 to but more like 199.00 to playand i told him to forget it. well next year i told them not to include me on derby day.. my misfortune, i did not tell him to add the extra cost while he was there because we are not normally large bettors being on fixed incomes.. again congradulations on your selections.. I have used the screener for three years now but May 3rd was my biggest score, .50 tri, $1 tri, $1 super & $2 exacta just shy of 10 grand. This is by far the best informational sheet you can buy. I was able to throw out Candy Boy because he did not look good at Churchill, had no energy, really tired after his work. I would like to know how you picked for the bomb to crash the super! This is my 2nd year buying the Super Screener…after missing out on the Superfecta last year by one position, this year, redemption was mine! Not only did I hit the $1 Superfecta for $7,691.90, but I also hit the $1 Trifecta for $1,712.30 – nice return on my invested $216. I have NEVER played anything beyond the odd 50-cent tri or maybe a ten-cent superfecta but I thought, if I’m going to play the Derby, go big! I got the Super Screener and have been poring over it for the last week and finally with a few tweaks to suit my own ‘risk level’ I played a superfecta based on the screener’s pick/toss/bomber ratings. My first foray into full-dollar supers paid $5720. I’m always skeptical of these testimonials but believe the ones for Super Screener–it works! In prior years I would always second guess myself because I never had the great information that the Super Screener provides. This year I had the Super Screener on my side. I felt confident and won on an exacta and a trifecta! $1196 won! Thanks, Super Screener! Awesome slections. I had big bet on http://www.tips1973.com and made huge. thanks a lot. Hit the Trfecta for $856! Thanks Super Screener! Last year, I made the mistake on my Superfecta ticket, by only playing your Bomber pick Golden Soul for a 3rd and 4th position. It haunted me all year not including him to run 2nd. Needless to say, I did not repeat that mistake this year with your Top Bomber pick Commanding Curve. I look forward to your Super Screener picks for the Preakness and Belmont races. Cashed in two trifecta tickets @ $856 each. A nice day. Congrats! It wasn’t a dream! Are you guys frickin kidding me! Commanding Curve @ 37-1! How did you guys pick that horse? Well I know you guys picked it because you explained in detail, but still – how did you pick it? Haha. I listened to Mike on the webinar and I want to say you are the most intelligent horse handicapper I’ve ever heard. Those “other guys” who send me junk mail bragging about their “Big Wins” are full of crap! What I like about you guys are that your bets and your picks are documented – wins and losses. You proven once again your system is superior to any other systems around. Is the Super Screener a computer? How many guys are on your team, is it just Mike? Your system for eliminating horses from the win spot is powerful, especially the 10 plus difference in the Bris ratings rule. I can bet against those horses with confidence. Thank you!!! By the way, I never won the Derby until yesterday. Hit $1 tri and $2 exacta for $2052!!! You guys are Frickin AWESOME!!! What a score for your first Derby win! Mike is the one and only behind the Kentucky Derby Super Screener, though he has gotten backup from Alex Zito with the Breeders’ Cup one in the past. Transparency is important to us so we always document the picks and tickets – even when we don’t score. Congrats again and good luck in the Preakness! I hit the $2.00 exacta using Super screener. The fact Commanding Curve was the Super Bomber according to the write-up made it easy. I also just missed the Trifecta (second and third backwards with first right). Great job on that exacta! I could kick myself for not doing what I planed to do. I had check the Superfecta and did not bet…Shame on me.. The next two races I won all my money back and some!!! Next Year it on.. Will bet the next race with you all…GREAT JOB!!! Thanks Mike & The Super Screener Team!. Got two friends to go in with me, bet a $1 Trifecta Box on your top seven. Cashed!. Nailed the winner & the trifecta. Well done! Won the exacta and trifecta; wish I had enough moxie (and money) to bet the superfecta because I would have won that too. Still, for a nominal series of bets (e.g., $1 exactas, $.50 tri’s), I was very pleased to win more than a grand profit. Thanks for doing what you’re doing. Awesome call on Commanding Curve. One Super, 3.5 Tris, and 5 Exactas!!! I did not use the recommended wagers, but used the Super Screener to help me pick the $1 Superfecta and the $0.50 Trifecta 3 times. A whopping $10,250 win! What a huge payoff for 3 of 4 chalk! The Commanding Curve suggestion was solid gold!! Awesome job, Congrats on the Big Derby score! Thanks a ton!!! I used the screener to make some of my own tickets. I used California Chrome on top with many combos from the horses suggested and the two bombers in Medal Count and Commanding Curve. Needless to say that I was able to hit $7 in exactas and a .50 cent tri. I am a small time player, but this day I cashed in over $2000 in tickets. By far my best derby ever!! Best $39 I ever spent! Great payout! Keep up the good work. Hope to have similar luck on Preakness. Great job on the picks in the Derby. The Derby was the first time I purchased the screener, you know your stuff. I left Danza out of my third and forth spots on my super ticket, still sick about it… Was all over it besides that. I can’t find the results from the 2013 Preakness on your website. I take it Oxbow did you in, either way, I’m all in after the Derby results. Do you have the screeners results from the 2013 Preakness? WOW!! For the first time ever, I hit the trifecta!! I was going to change the order of horses you gave, and then I said “Hey, I have been losing for years, let me keep the way SuperScreener told us to so.” And I did and I’m so happy today. No handicapping team can touch your SuperScreener, you’re the BEST! Thanks! !